Play back and edit scanned sheet music and PDFs. 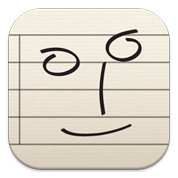 Quickly and accurately write music notation with stylus or mouse. Use on its own, or with Sibelius, Finale, Cubase and most music programs. 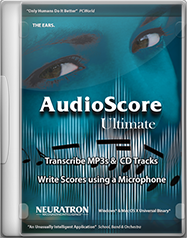 AudioScore Ultimate offers powerful tools to help you transcribe MP3s and CD tracks. You can also create scores by singing or playing into your computer using a microphone. 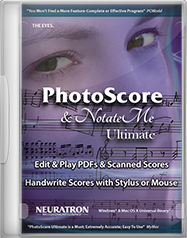 Use on its own or with Sibelius, Finale, Pro Tools, Cubase and most music programs. Smartphone/tablet music composition and notation app, featuring powerful handwritten music recognition. Quickly and accurately enter music notation with your finger or stylus, on a tablet or smartphone. Now available for Android and iOS. Hit'n'Mix will strip an audio track down into its basic building blocks, allowing you to play back and remix guitar, voice, drums and so on, all individually. Scanning, recording and transcribing copyright music without permission is illegal.